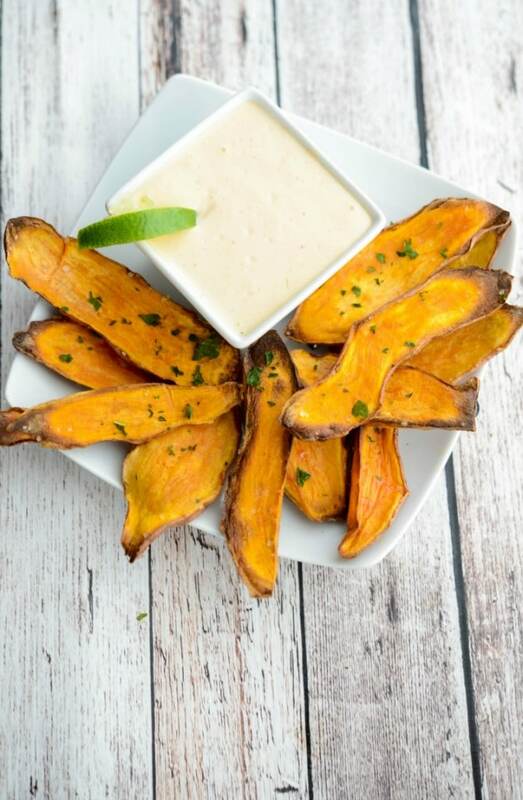 At only 31 calories each, these Baked Sweet Potato Skins with Sriracha Lime Aioli are a healthier option to game day snacking. 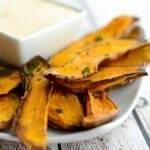 To round out this weeks’ healthier game day snacks, I made these Baked Sweet Potato Skins with Sriracha Lime Aioli. 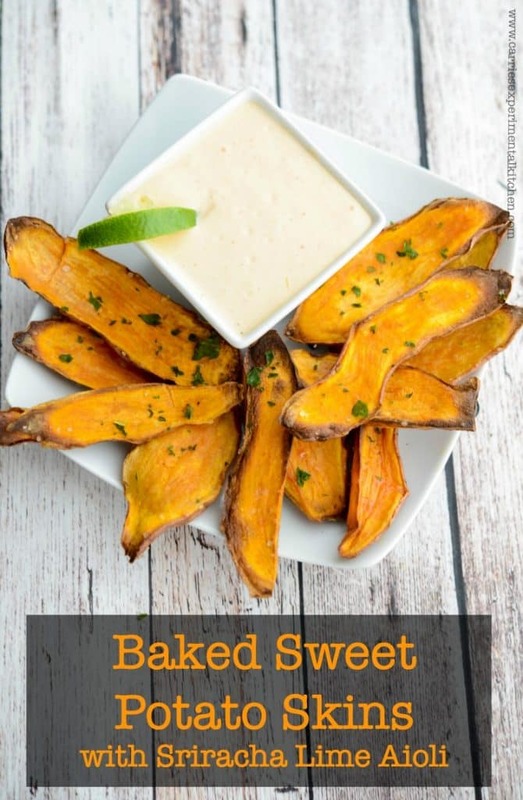 Sweet potatoes are naturally sweet, but dip them into a spicy-citrusy-creamy dip and they take on a whole new flavor. As much as I loved the Eggplant Caponata and Baked Honey Garlic Chicken Wings, these potato skins were my personal favorite. Start by washing the skins of the sweet potato with a vegetable brush under warm water to remove any excess dirt. Then using a sharp knife, peel away strips of the potato skin with some of the flesh. I used six medium sized potatoes and got twenty four skins. 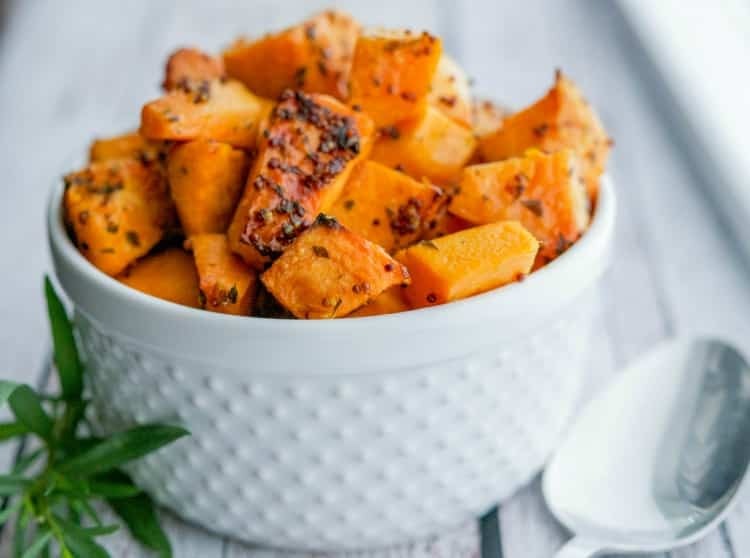 Save the remaining potato flesh for other uses like Mustard & Tarragon Roasted Sweet Potatoes or Dijon Braised Chicken with Sweet Potatoes. Add the potato skins to a baking sheet and brush with some extra virgin olive oil; then sprinkle with Kosher or sea salt. Bake in a 450 degree F oven for 20 minutes. 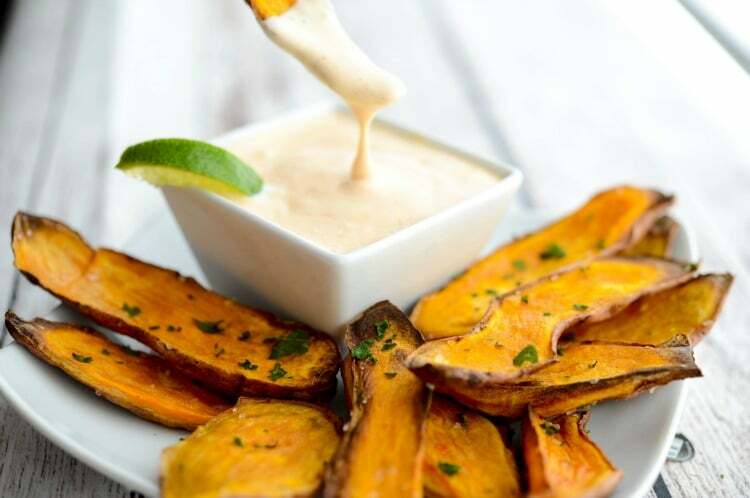 While the potato skins are in the oven, make your Sriracha Lime Aioli dipping sauce. In a mini food processor or blender, combine the Sriracha, or any other hot sauce you prefer, fresh lime juice, mayonnaise and garlic; then pulse until smooth and creamy. This dip makes 1 cup (16 tbsp/1 tbsp per serving) and has 92 calories per serving. I used regular Hellmann’s mayonnaise, but you can use whichever mayo you prefer. 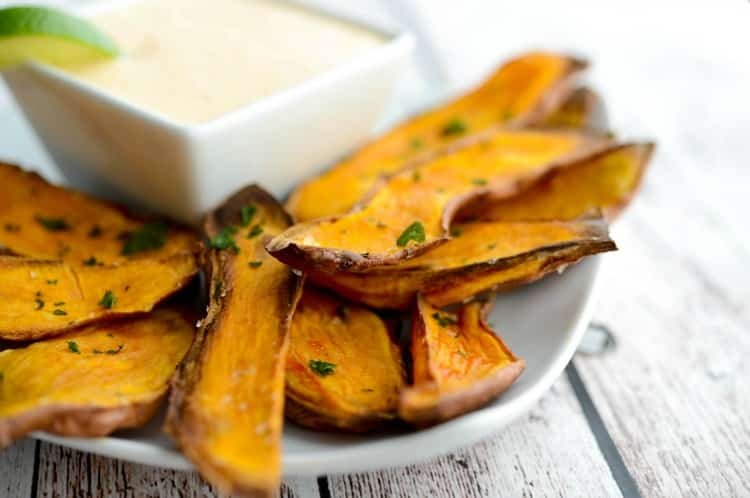 These Baked Sweet Potato Skins with Sriracha Lime Aioli are a healthier alternative to most calorie laden game day snacks and are so easy to make. They’re even tasty enough without the dipping sauce and make a great mid-afternoon snack or side dish to your main meal. ~Enjoy! Wash the skins of the sweet potato with a vegetable brush under warm water to remove any excess dirt. Then using a sharp knife, peel away strips of the potato skin with some of the flesh. Add the potato skins to a baking sheet and brush with the oil; then sprinkle with salt. Bake for 20 minutes. 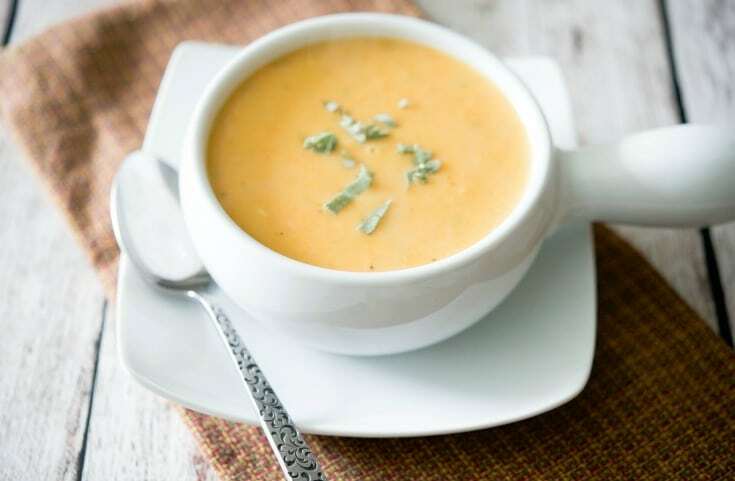 Combine all of the ingredients in a mini food processor and pulse until smooth and creamy. Makes 1 cup. Can’t wait to make them!!! Always love your recipes! Thanks Desi, these were so good!